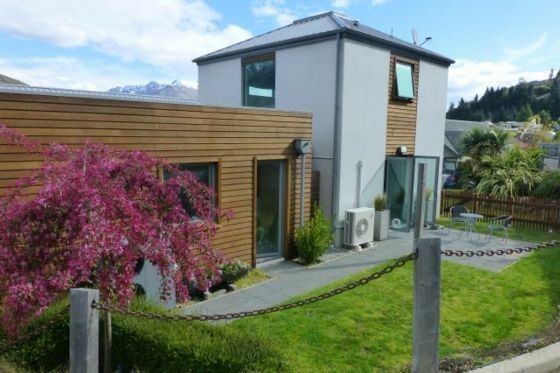 Our apartment is located on a quiet street and has fantastic views of the Remarkables and Lake Wakatipu. The Frankton boat marina and the lake front walking and biking tracks are only a short stroll away. You can walk or bike along the track to the shopping centre in Frankton or to Queenstown CBD and the beautiful gardens. The apartment is a peaceful retreat from all the hustle and buzzle of Queenstown only a short drive away. We expect our guests to value our property, behave in a respectful manner during their stay and leave it in a tidy condition after departure. The property was clean, well presented and comfortable. We liked the situation and found getting the bus into town very easy. The views of the mountains at sunset from the bedroom window was amazing. The apartment has everything you need for a great stay, with wonderful views over the lake from the bedroom upstairs. The owners, Bruce and Annika, were very accommodating, checking that we had everything we needed and kindly lending us a couple of folding chairs and a picnic mat when we attended the Gibbston Valley Winery Concert. The Frankton shops, airport and lake are nearby. Would definitely stay here again. Very central to boat ramp and Queenstown. Nice and quiet. Upstairs bedroom where you sleep has no air conditioning so it gets very hot. Lovely kitchen, lounge and courtyard. Everything you need for a comfortable stay. Even provided cereal, fruit and milk which was a lovely surprise. The Christmas tree was a very nice personal touch. This rental was a very comfortable place to land after weeks exploring New Zealand. The abundance of space on two different levels was a welcome luxury. The kitchen was perfect for making simple meals, the queen bed was very comfortable and the views are spectacular from the bedroom. The young family who own the property could not have been more welcoming and accommodating. Not far from Queenstown, it’s an easy drive in and takes no time at all. Would stay here again should I need loathing in Queenstown in the future. Stunning views, very warm unit and a nice quiet place. This place was the most perfect size for my fiance' and i, very modern and tidy.